1. Polar dielectrics. The molecules of some dielectrics, like water, have permanent electric dipole moments. In such materials (called polar dielectrics), the electric dipoles tend to line up with an external electric field as in . Because the molecules are continuously jostling each other as a result of their random thermal motion. this alignment is not complete, but it becomes more complete as the magnitude of the applied field is increased (or as the temperature. and has the jostling, is decreased). The alignment of the electric dipoles produces an electric field that is directed opposite the applied field and smaller in magnitude. 2. 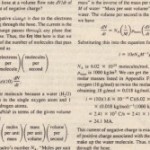 Nonpolar dielectrics. 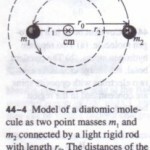 Regardless of whether they have permanent electric dipole moments, molecules acquire dipole moments by induction when placed in an external electric field. In Section 2S-7 2), we saw that this ,occurs because the external field tends to “stretch” the molecules, slightly separating the centers of negative and positive charge. A nonpolar dielectric slab with no external electric field applied. In an electric field Eo is applied via a capacitor, whose plates are charged as shown. The result is a slight separation of the centers of the positive and negative charge distributions within the slab, producing positive charge on one face of the slab (due to the positive ends of dipoles there) and negative charge on the opposite face (due to the negative ends of dipoles there). The slab as a whole remains electrically neutral and-within the slab-there is no excess charge in any volume element. shows that the induced surface charges on the faces produce an electric field E’ in the direction opposite that of the applied electric field Eo. The resultant field E inside the dielectric (the vector sum of fields Eo and E’) has the direction of Eo but is smaller in magnitude. Both the field E’ produced by the surface charges in and the electric field produced by the permanent electric dipoles in act in the same way they oppose the applied field E.Thus, the effect of both polar and nonpolar dielectrics is to weaken any applied field within them, as between the plates of a capacitor. We can now see why the dielectric porcelain slab in Sample Problem 26-S is pulled into the capacitor: As it enters the space between the plates, the surface charge hat appears on each slab face has the sign opposite that of the charge on the nearby capacitor plate. Thus, slab and plates attract each other.